See Our Students Finished Quilt here. Hitty Petal shows off her new quilt. Register by clicking here. An email will pop up, so just let me know you want to take the class. Once you have registered, you will be given information on how to pay for your class. I accept PayPal, Money Orders, and Checks. Registration accepted until the day of the class. Once you have paid, you will be sent a supply list, so you can have your supplies on hand ahead of time. The Online Location of the Class will be sent out on the day the class begins. Class begins Saturday, September 9th, 2006. Remember--because this is an online class, you can start anytime after you receive the URL for the class pages, and it doesn't have to be that Saturday. You can work in your jammies if you want--no need to dress up for us! If you get bogged down or something isn't clear, you will be able to ask Julie Old Crow for help by clicking the link either here or on the class page. I have long wanted to attempt a copy of the original quilt for Hitty myself, but the tricky way of placing the strips threw me. However, after careful study, I soon realized it was actually a quilt block based on a Log Cabin variation. It has been called Log Patch, Colonial Block, Interlocked Block, Log Cabin Variation, American Log Patch, and Courthouse Variation, among others. 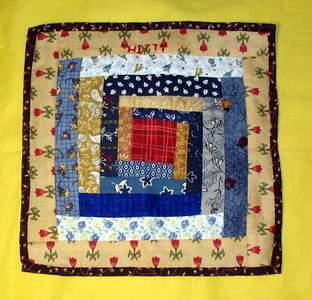 It consists of a center square, with equal-sized rectangles placed in units of four around the quilt. The rectangles in each unit are staggered instead of sewn straight across each side--but not as hard to sew as they look. Normally, this type of pattern would follow a light/dark/light/dark color scheme, and this quilt has mostly kept to that tradition. Also, the traditional red center (symbol of hearth and home) was used by starting with a red check/weave fabric. 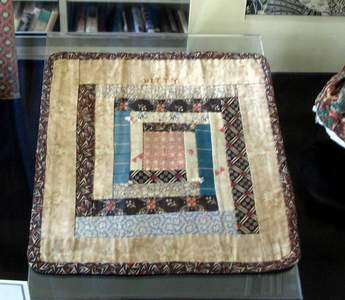 One difference in this particular quilt is that the maker did not follow the traditional Log Cabin or Courthouse Steps pattern of using the same color twice in each unit. Normally, this would follow a dark top, dark right side, light bottom, light left side pattern. The maker here decided to use several different colors, although if you look carefully, you can see there are some repeats throughout the quilt. 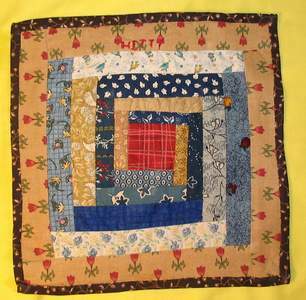 The size of several of the strips in each unit of the original quilt appear to vary, but I think that is due more to the maker's sewing skills, than to any deliberate variation. When you are sewing such small pieces, it's very hard to keep a perfectly straight row. The first two sets of rows around the center square really are smaller than the last two rows, and the final light row is significantly larger than the other rows. The final small 'row' is actually the binding edge. The back of the original quilt is plain cotton. In this version, we will be using a print backing, and bringing it forward to form the edging. There are no quilting stitches on this quilt. Instead, it features white yarn ties (4). According to my research, the original quilt measures about 8"x 8". It is hand-pieced and has a 'plain weave' filler and backing. This is all held together with the binding around the edge. I also chose different colors than the ones shown here, choosing to go with creams and blues. Due to the upsurgance in vintage prints, if you really wanted to research these fabrics, you could probably find some close to the originals. 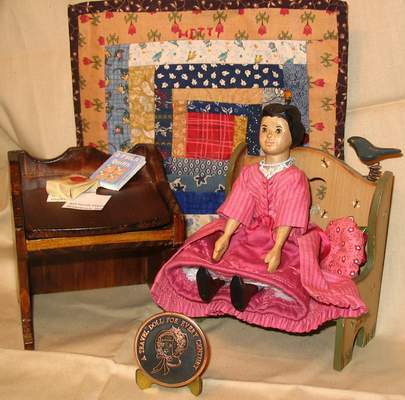 The final touch is the name "HITTY" embroidered on the quilt in red block letters. In my version of the quilt you won't need a pattern. All the pieces are rotary cut (or do it by hand if you really, really want!) to a specific size, and sewn on in a specific order. Best of all--this quilt uses many small scraps of fabric, so you most likely will not need to purchase any (unless you really, really want to, LOL!) We will tea-dye the finished quilt to tone down our bright fabrics--but you can always leave out this step if you prefer. However you choose to make your Heirloom Hitty Quilt, you will be very pleased with the final product. This is a lovely, soft little quilt, and just perfect for all of our Hittys.